An adult great blue heron perches beside at least one nestling (others could be hunkered down) at a colony in Kennebec County. 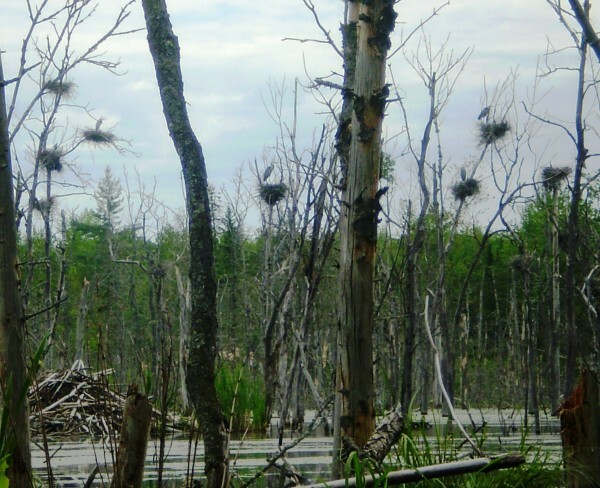 A great blue heron colony is found within a beaver flowage in Maine. 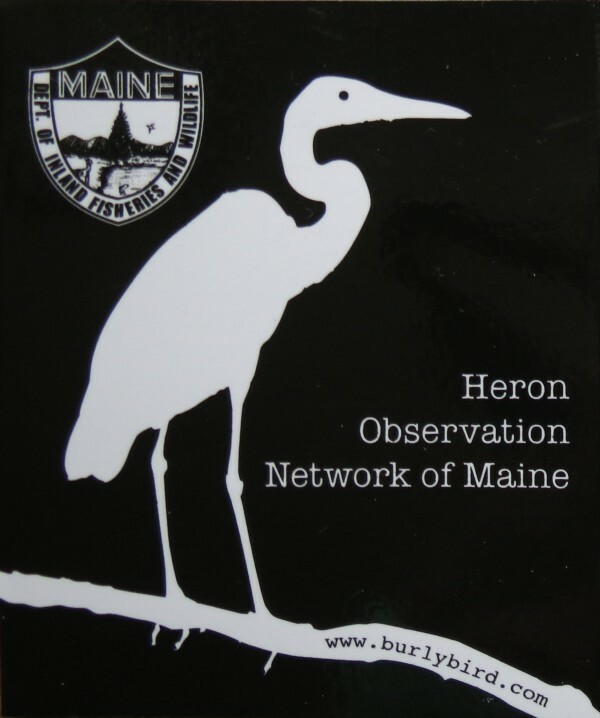 Heron Observation Network sticker, a partnership between MDIF&W and Burly Bird. 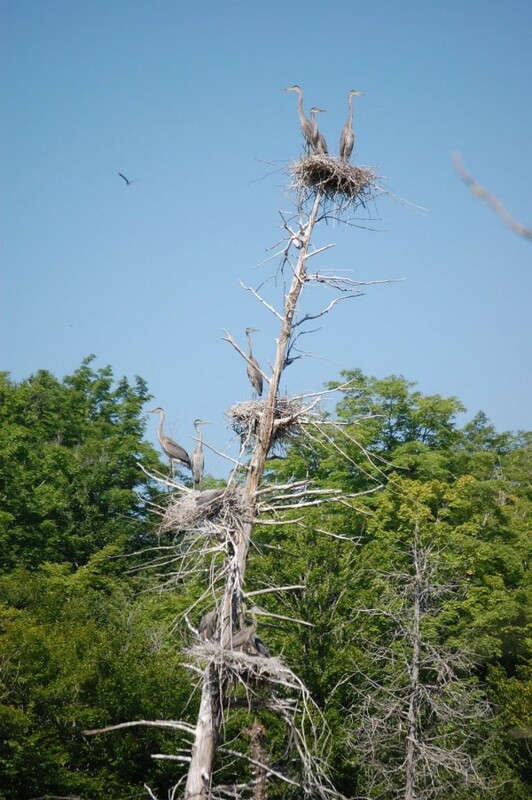 Four great blue heron nests hold nestlings that are 6 to 8 weeks old and soon to fledge in Penobscot County during a recent spring. The great blue heron population has dropped an estimated 66 percent on Maine’s coastal islands in the past 40 years, said D’Auria, who specializes in non-game wetland birds. The population plunge is likely connected to the growing number of bald eagles nesting on the islands. Not only do the two species compete for food, the bald eagles is powerful enough to prey on the great blue heron. Human disturbance also negatively impacts the heron colonies. Whatever the cause, the great blue heron was designated as a Species of Special Concern in Maine in 2007. Since 2009, the MDIF&W ramped up its monitoring efforts by establishing the Heron Observation Network of Maine, or HERON, which enlists volunteers to monitor inland colony sites across the state through their adopt-a-colony program. 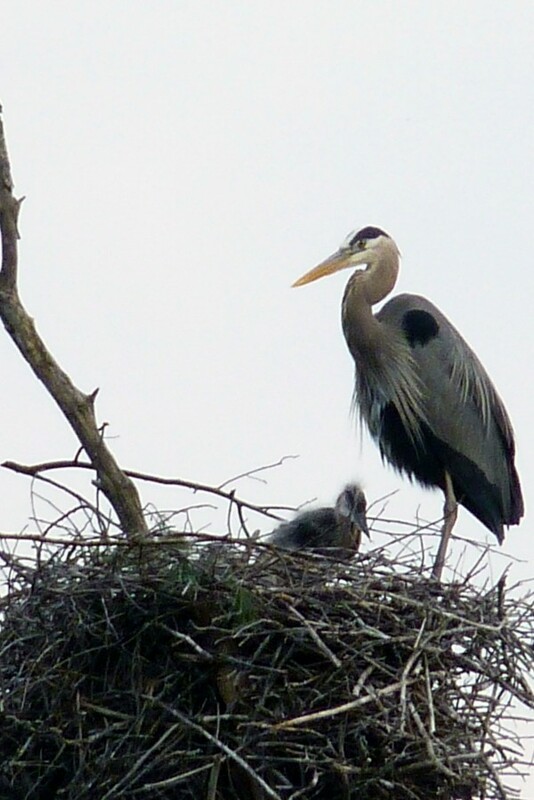 It’s believed that the great blue herons living inland have benefited from the recovery of U.S. beaver populations, which have created a patchwork of swamps and meadows ideal for the heron to forage and nest in, according to Cornell Lab of Ornithology. The difficulty in monitoring the inland population of great blue herons is that they’re so widespread. They nest in trees (living or dead), but about 90 percent of Maine is forested. They prefer to nest by water, but there are more than 6,000 lakes and ponds in Maine, and the state’s coastline is about 3,500 miles long. In 2009, the DIF&W Bird Group counted 1,071 pairs of great blue herons at 83 colonies (all known colonies statewide). Since then, HERON volunteers working to monitor heron colonies by ground have learned about 40 additional colony locations, though not all of those colonies are active in any given year. But they have yet to gather enough information to confidently estimate how many of the birds summer in Maine. It won’t be until the 2015 breeding season (May-June) that a much more effective aerial survey of colonies will be conducted. In November, HERON partnered with Burly Bird, a Maine-based conservation sticker company, to help raise funds for the 2015 aerial survey. The public can now support the survey by purchasing a UV-coated vinyl sticker that sports a black and white silhouette of the great blue heron, a custom Burly Bird design. The sticker — which can be purchased from the Burly Bird website or through the MDIF&W’s online store — is $4, with $3 going directly to fund the survey. Sticker sales will also help leverage federal funding through Maine’s State Wildlife Grant Program. For information about the Heron Observation Network of Maine, visit maineheron.wordpress.com. To purchase a HERON sticker to support the 2015 great blue heron aerial population survey, visit burlybird.com or maine.gov/ifw/. To report a great blue heron colony or ask questions about HERON, contact D’Auria at danielle.dauria@maine.gov or 941-4478.